For greater peace of mind, this sturdy access control unit provides a rugged keypad with advanced access control features in an aesthetically-designed housing. Come rain or shine, this unit can handle the challenge, with its extremely-strong metallic housing and waterproof enclosure for maximum durability. The backlit keypad, with its auto-dimming option is clearly visible day or night, making these units ideal for Self-Storage Facilities. This keypad requires a phone line in addition to the standard wires. High Visibility: Customers easily see the backlit numbers and LED lights. Remote Intercom: Intercom dials a pre-set phone number. Weather Proof: Keypads are epoxy filled to prevent damage from moisture. 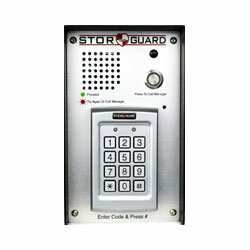 Warranty: Standard 5-Year warranty on all Stor-Guard Keypads. Pinhole Camera: Close up photos of who is entering your facility. Easy Install: Mounts to Stor-Guard Gooseneck Stand or flush on any wall.